Greetings boys and girls, and welcome to the next step in my bid to completely take over Chag’s blog, MWAHAHAHA!! …Ok no, not really. Simply put, this started as a one-off figure-related article that sort of mutated into what you see now. As to whether this will continue on or not, I guess we will just have to wait and see, but for now this will be a little slice of the internet where I try to introduce a few little Vocaloid songs and PVs to y’all. I’m pretty much doing this because Vocaloids are one of my few passions, thus I know all too well how hard it can be to track down songs. Between different PVs/covers/remixes for the same song, subs, dubs, and multiple people uploading the same exact thing in various audio quality levels, it’s often a nightmare to look through it all, so I figured I’d share the songs and videos I’ve come to love the most. But first I guess an introduction is in order, eh? Vocaloid is the name of the program developed by Yamaha for voice synthesizing. This program has two generations with a third currently in development. Individual companies (Like Crypton, the company responsible for Miku) take Yamaha’s program and mate it with a human voice (or voices) to produce the final product many have come to know and love. This here is the entire Japanese Vocaloid family save for the two latest entries, Lily and VY1 (There are English language Vocaloids as well, as well as fan-made spinoffs galore, but I’ll cover those as needed). I could give you a lot of hoopla on each one, but since you don’t really need that to enjoy the music, I’ll just keep it short for now. Below is a list of the offical Vocaloid characters that have been released so far, along with the ages of the characters, their studios of origin, their character items, any anything else that may be of note. Kiyoteru Hiyama ?? AH Software ??? Whew… so yea, that’s that. If this article makes through its maiden voyage here, I’ll expand some more on the background info and also the various fan-made versions of each of the characters in the weeks to come. Anyway, enough of that BS lets get to the damn music already!!! Since this is the first song of the first (Maybe?) article I think its only fitting to start with the first lady of Vocaloid, Meiko. This is a bittersweet tale of Romance even after rebirth and finding the courage to let love go. Enjoy. *sniffle* Ah crap, I got some dust in my eye…*ahem* Well, not bad for the old girl, eh? It’s one of my favorites from her. I will leave you with an absolutely gorgeous and heartwarming song done by one of my favorite producers, Dixie Flatline. The vocals are led by Miku, along with Rin, Len, and Luka singing the chorus as they give thanks to all those who gave their voices life and all those who will continue to do so from here on out. And that just about does it. This article was kind of written in an uncertain manner because neither myself nor Chag really knew if this was even going to be posted, let alone going beyond the first article, but it looks like it will in the end! So I hope everyone enjoyed at least one of the songs! 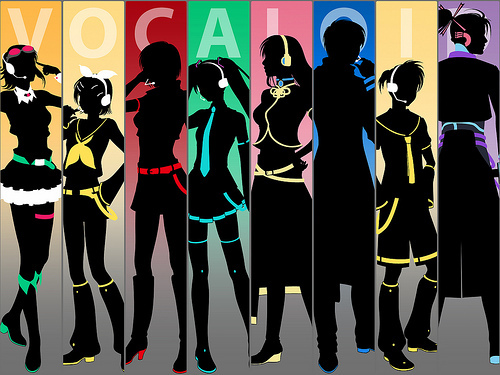 Look forward to next time when we get into Fanmade Vocaloids and of course, more music! If only most J-Pop singers were half as good at singing in English as well as Luka, then maybe I there wouldn’t be a imprint of my forehead on my wall. I really, really like Yume no Tsuzuki, because above all else, I love vocaloid for its celebration of creativity. Most of these vocaloid producers are not doing it for record sales and personal fame — in most cases, the only they get out of a song’s success is internet bragging rights. Yet they still spend enormous amounts of effort to make songs to express themselves, and it’s this genuine touch that really resonates with me, even if the songs are sometimes cheesy and coarse. They’re kind of like a sweater knitted by your grandma as opposed to a brand-name sweater you buy from a mall — sure, the latter may look prettier and feel more comfortable, but there’s no replacing the charm of granny’s own handiwork. Some fan make Miku to sing Malay song too. Can you believe it? The best one of Miku I heard so far is this one Melody of life. Far more elegantly put then I ever could say haha…I just kinda picked songs at random out of a list so glad you liked even one. As for how? Erm combination of roaming NND like you said and randomly poking around Youtube mostly…There’s a whole lot of…Well less enjoyable things to sift through, but I find it rather satisfying when you stumble across something thats a pleasure to listen to. Let me be the first to say that you, fine sir, have taste. Dixieflatline needs more love. Only Japan could take a virtual singing program and make it such a success that they were able to do a live concert using idols that don’t really exist. Not that I mind, as I wait for the giant Takoluka plush to be officially announced/released. The recent release March 7th, 2013 of Miku Hatsune Project Diva f PS3 version is AMAZING. Literally a Masterpiece in gaming edition and its not just a simple rhythm game that people first assume.